Discussion in 'NBA Dish' started by TMac'n, Sep 7, 2018. Defense attorney Greg Simpson tells the Star Tribune his clients deny the allegations and will "vigorously" fight the suit. Banks was not named as a defendant. Banks was sentenced last year to four years in federal prison for defrauding another former NBA star, retired San Antonio Spurs player Tim Duncan, of millions of dollars. Damn... That's some **** there. why would he deserve it? dkim1984, TMac'n and Game7 like this. cuz he cannot stand his guts. Lesson of the day: Manage your own $. Whats the point of suing? Hes not going to get any of it back. 77 million dollars is an insane amount of money to steal haha. Yeah, I mean KG should have at least checked in on **** from time to time. I get it that you trust people to manage your money, but holy **** that is a ton of money missing that could or easily been noticed. How the hell do you embezzle 77 million dollars from one person and not get caught immediately? I assume you present your client with lots of JCDenton-level graphs. ClutchCity3, Rashmon, JCDenton and 11 others like this. Real gangsters pimp pens, not pistols. The hood needs to learn this. dmoneybangbang, macho GRANDE, rhee and 3 others like this. A simple example: I propose to you a grand real estate endeavor. Once you agree to the idea, I explain the monthly draws necessary to keep the investment moving along and continually update you the current status of the project. 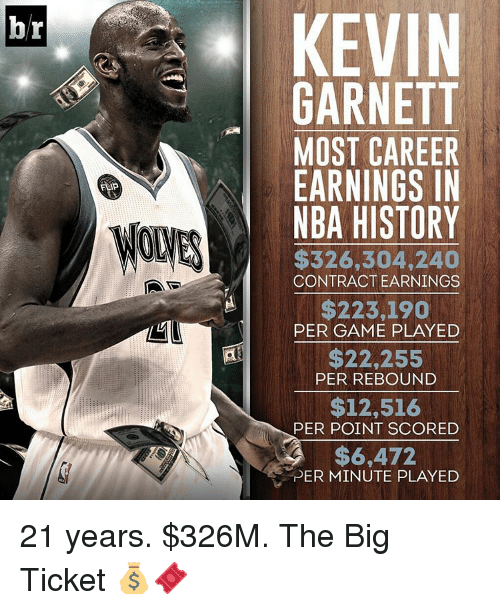 You (Garnett) are too busy with things such as TNT /Area 21 and can't physically follow up with the progress yourself or don't have the ppl available, and you trust your financial planner / manager. Then when the project is supposedly 75% complete, you're financial planner disappears and you discover that the project was fabricated from the get go. UTSA2step, dmoneybangbang, macho GRANDE and 1 other person like this. Where was Spencer Strausmore and the guys from ASM when he needed them. When you have so much money why not just put it in treasury bonds or index funds. I could never figure this out. Put it in half Treasury and half S&P 500 index and you'll have more money than you will ever me. Even a 5% return on 80 millions is over $4 million a year you can spend. I have no idea why these guys keep getting conned into Real Estate, LLC, and other investment. For every Magic Johnson, Kobe, or Lebron that have done well with their investment, there are more suckers like Tim Duncan and KG that lose everything investing in things they know nothing about.